Fabulous Peculiarities traces the artistic evolution of Canadian artist Tony Calzetta, whose penchant for experimentation and ability to both work within and subvert the rules has resulted in a unique and complex but unified aesthetic. Tony Calzetta, at rest in his studio. Over the past four decades, Canadian artist Tony Calzetta has developed a bold style and a unique visual lexicon. 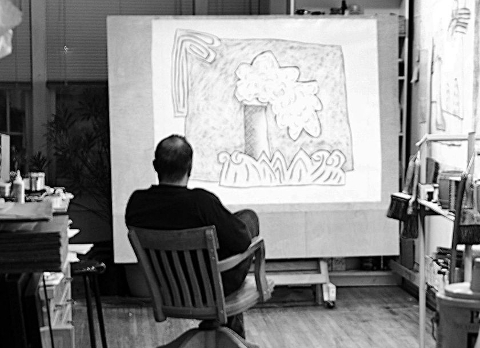 In Fabulous Peculiarities, veteran author, art gallery director, curator and columnist Tom Smart teases out Calzetta’s many and varied artistic influences, from American painter Philip Guston to Canadian critic, author and editor John Metcalf. Smart also examines Calzetta’s efforts to engage audiences in the interpretation of his works, resulting in unique and complex visual narratives. As Smart explains, the culmination of this interest is Calzetta’s collaborative livre d’artiste created with award-winning writer Leon Rooke and printmaker Dieter Grund: a zany, surprising masterwork entitled How God Talks in His Sleep and Other Fabulous Fictions. Text, image and narrative collide in this investigation into the intersection between visual art and storytelling. Featuring over a dozen full-colour reproductions of some of Calzetta’s seminal works, Smart’s biographical eye highlights the groundbreaking work of one of Canada’s great artists. This ePub edition of Fabulous Peculiarities is produced with the support of the Peel Art Gallery, Museum + Archives and is published by the Porcupine's Quill to coincide with the opening of `Fabulous Fictions & Peculiar Practices: Tony Calzetta and Leon Rooke', an exhibition curated by Tom Smart for PAMA (April 1 to June 19, 2016) and held in conjunction with the inaugural season of Brampton's Festival of Literary Diversity (FOLD). Author, art gallery director, curator, columnist and special advisor to art galleries and museums, TOM SMART is especially noted for his award-winning critical biographies, catalogues and monographs on Canadian artists, including Foreword IndieFab Silver winner Jack Chambers’ Red and Green. To date, Smart has written about painters Alex Colville, Christopher Pratt, Mary Pratt, Tom Forrestall, Miller Brittain and Fred Ross; graphic novelist George A. Walker; and sculptor John Hooper. Smart has worked in art galleries and museums across Canada and the United States, among them the Beaverbrook Art Gallery, the Winnipeg Art Gallery, the Frick in Pittsburgh, and the McMichael Canadian Art Collection where he was Executive Director from 2006–2010. Smart’s essay ‘The Wood Engravings of Rosemary Kilbourn’ was recently published in the Devil’s Artisan. But Louie Sells What He Makes (1986); Tony working with Dieter Grund at Presswerk Editions; Detail from ‘How God Talks in His Sleep’. This is a core idea that animates the drawings, paintings and prints of Canadian artist Tony Calzetta, and that has inspired the poetry and prose of his author colleague, neighbour and friend Leon Rooke. Together, Calzetta and Rooke have bred bookworks whose parents are drawing, painting, printmaking and poetry. Their two 2009–2010 offspring,Fabulous Fictions and Peculiar Practices, are something else altogether: amalgamations of voices and styles, modes and meanings, that are truly operatic in their scope and that embrace many artistic forms. If you are using an Amazon Kindle, or a device that runs the Kindle App, you will need: sf2_kindle.mobi. If you are using an Apple device (tablet, smartphone, laptop or personal computer) you will need: sf2_ibooks.epub. If you are using any other device, including Android devices (tablet, smartphone), dedicated e-readers (such as a Kobo or Sony Reader) or a personal computer, you will need: sf2_epub.epub.